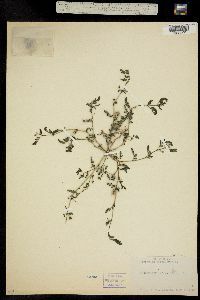 Annual herb forming mats to 1 m wide Stem: prostrate, branched from the base, and hairy. 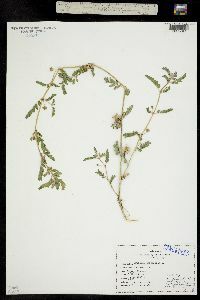 Leaves: opposite, pinnately compound, short-stalked, 2 - 6 cm long. 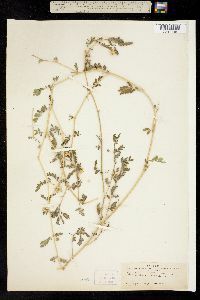 Leaflets usually in pairs of six to eight, 0.5 - 1.5 cm long, oblong. Flowers: solitary, in axils, on 0.5 - 1 cm long stalks, yellow, to 1 cm wide. Sepals awl-shaped. Ovary five-chambered. Stamens two to three times as many as petals. Fruit: dry, indehiscent, splitting into five segments, to 1 cm wide, spiny, with tuber-like projections. Each segment divided into three to five one-seeded compartments. Habitat and ecology: Introduced from Europe. Local along unpaved roads and streets, and in the parking lots of towns with sandy soil. 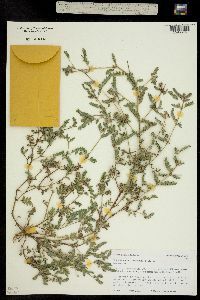 It has also been found along railroads and in sandy cultivated fields. Etymology: Tribulus is the Latin name for a caltrop, referring to the spiny fruit of this plant. Terrestris means terrestrial. Annual; stems hirsute, branched from the base, forming mats to 1 m wide; lvs short-petioled, 2-6 cm, one of each pair distinctly the larger; lfls usually 6-8 pairs, oblong, 5-15 mm; peduncles 5-10 mm; fls 8-10 mm wide; intrastaminal glands distinct, not forming a ring; body of the fr 1 cm thick, each segment with 2 stout divergent spines and a longitudinal row of tubercles; 2n=12, 24, 26, 48. 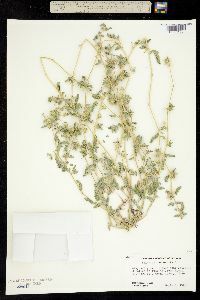 Native of the Mediterranean region, well established as a roadside weed in w. U.S., and occasionally found in our range.